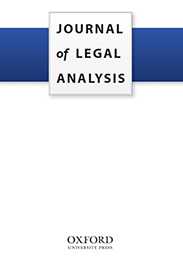 The Journal of Legal Analysis, founded in 2009, is a fully open access peer-reviewed general journal on all aspects of law. It welcomes traditional legal articles as well as interdisciplinary work, and invites submissions from scholars worldwide. The Journal of Legal Analysis is published by the Oxford University Press on behalf of The John M. Olin Center for Law, Economics and Business at the Harvard Law School. The journal is underwritten by a generous grant from the Considine Family Foundation, and continues to enjoy the strong support of the Harvard Law School and the John M. Olin Center for Law, Economics, and Business. Cooperation without a third party enforcer, the theory holds, can occur, but it is most likely to succeed when groups are sufficiently small and/or sufficiently homogeneous (e.g. Ostrom, 1990; Ellickson, 1991; Bernstein, 1992; 2001; Hadfield and Weingast, 2012; 2013; 2014). Contemporary, globalized, territorially extensive nation states appear doomed to submit to national or global Leviathans (Tilly, 1992; Fukuyama, 2011; 2014; Acemoglu and Robinson, 2012; Morris, 2014). Hobbes’ predicament, restated by his 19th century successor, Max Weber, still dominates the social sciences. Developed western governments may consider themselves beyond Hobbes’ pessimistic view of human nature and of the necessity of building a state that keeps members of the community ‘in awe.’ Yet, the notion that centralization is our best hope to avoid widespread social violence and coordination failures still informs the theory and practice of institution building in the developing world. We take a different view. 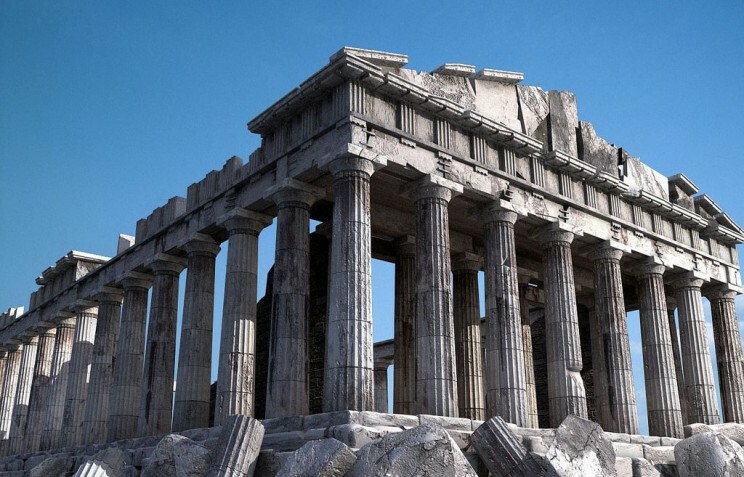 Our claim is that it may be possible to achieve economic and political development without extensive centralization, even in relatively large-scale and heterogeneous communities and that Classical Athens is a model case exemplifying this. Can Athens help us rethink the process and goals of institution building, particularly legal institutions, in modern developing countries? Classical Athens provides a unique laboratory for studying the institutional arrangements that enabled a large-scale civilization to reject strong centralization as the guiding principle to solve the collective action problems that plague social order (Ober, 2015). With a total population of ca. 250,000 people, and a territory of ca. 2500 km2, Athens was a bit less populous than Vanuatu and a bit smaller than Luxembourg. Yet, Athens was certainly not a community of fishermen, a group of cattle herders, or a guild. Smaller than most contemporary states, Athens was larger than most of its immediate neighbors (other Greek poleis) and its inhabitants were, on average, better off than those of most pre-modern societies. The sources suggest that the city and its harbor extension—the deme of Piraeus—were largely populated by Greeks sharing a common culture, language, and religion. Yet, we also hear of a number of non-Greek aliens and foreigners that came progressively to share the material and cultural advantages of living in a prosperous open access society (Carugati 2015; Ober 2008). Athens was not as ethnically diverse as most modern countries, but socioeconomic cleavages, rather than ethnicity, constituted a primary source of conflict (Ober, 1989). Image credit: Parthenon: Acropolis, by Sam Valadi. CC-BY-2.0 via Flickr. For roughly 200 years (ca. 508-322 BC), the ancient polis of Athens achieved exceptional levels of prosperity, order, and stability under a democratic government. Unlike modern developed democracies, Athens did not establish strongly centralized legal institutions, such as a hierarchy of authoritative formal courts, public prosecutors, expert judges and lawyers, and an organized police force. These institutions are often regarded as the sine qua non for the establishment of a robust rule of law, on which economic growth and democratic stability depend. How, then, can we explain Athens’ success? Our paper, “Building Legal Order in Ancient Athens,” explores the role that Athens’ distinctive legal institutions played in fostering social order, democratic stability, and high and sustained economic growth. Athenian laws and legal institutions fostered order, stability and prosperity by securing common knowledge of rules and incentivizing enforcement efforts in a decentralized system of coercion. Common knowledge and incentive-compatibility relied on widespread participation of ordinary people at all stages of the legal process – that is, in creating rules, in managing adjudication, in declaring what counts as a violation, and in enforcing the penalties for rule violation. Participation, in turn, helped the evolution of rules that benefited all, applied to all, and were consistent with longstanding community norms. We can derive four lessons from the Athenian case: first, involve ordinary people; second, foster common knowledge about rules and classifications; third, make sure that benefits of the rules are universal among enforcers; and fourth, maintain continuity between pre-existing norms and new rules as long as needed to stabilize the acceptance of new institutions across a population. These are not obviously easy lessons to follow in the modern world. Three main obstacles present themselves. First, maintaining the compatibility of pre-existing traditional norms with new rules in some cases (e.g., gender equality), even if only on the path to a more robust legal order where new rules can emerge, will seriously challenge today’s human rights standards. Second, the costs that participation imposes on the allocation of an individual’s limited time and resources may exceed what our poorest communities can tolerate. And third, the threat that decentralized enforcement may lead to social violence is especially worrisome in a world where the weapons are no longer just spears, clubs, and poison but extend to automatic weapons and car bombs. Nonetheless, we think the Athenian case shows that decentralized enforcement can be consistent with social order, economic prosperity, and even an expansion of individual rights (in the mid-4th century, the Athenians extended economic and legal privileges to slaves to incentivize their economic activity, Carugati, 2015). Whether similar results can be achieved in modern developing countries remains a question that only further theoretical and empirical work can answer. We hope to foster a new agenda that reflects seriously on alternative ways of providing critical public goods in places where centralized institutions have proven hard to implement and where the lack of reliable rule enforcement mechanisms is and remains one of the toughest obstacles to individual prosperity and well-being. Federica Carugati received a PhD in Classics and an MA in Political Science from Stanford University. She is currently a Visiting Scholar at the Ostrom Workshop, the Political Science Department, and the Maurer School of Law at Indiana University, Bloomington. Gillian K. Hadfield is the Richard L. and Antoinette Kirtland professor of law and professor of economics at the University of Southern California. Barry R. Weingast is the Ward C. Krebs Family Professor, Department of Political Science, and a Senior Fellow, Hoover Institution. Together, they are the authors of “Building Legal Order in Ancient Athens,” published in Journal of Legal Analysis.